Double Olympic gold medallist James Cracknell has succeeded in his attempt to break the world record for paddling the English Channel on a surfboard. In his second attempt in a week, the rower made the journey in five hours and 26 minutes, beating the current record by nearly an hour and a half. Mr Cracknell, 33, from Woking, Surrey, paddled from Folkestone to Cap Griz Nez, near Calais, on Sunday. 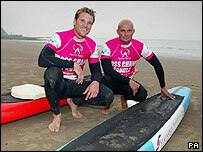 He was accompanied on another surfboard by surf coach Pete Craske, of Cornwall. The pair used 16ft boards - which were a cross between a surfboard and a kayak. They beat the world record of 6hrs and 52 minutes, which was set in 1996 by a team from California. Mr Cracknell, who won gold in the Sydney and Athens Olympics, and Mr Craske had been forced to abandon their first attempt at breaking the record on Monday when they got stuck in a swell eight miles off France. The pair's achievement on Sunday also raised more than £30,000 for the charity, Access Sport, which encourages young people to take part in sport. Speaking afterwards, the Olympic star admitted he had become "seriously tired" half way across the Channel. "I am feeling very tired now and I have to say I started to struggle two thirds of the way there. "I know we beat the record by over an hour but to paddle for five and a half hours is still a very long time. I think I was strong when Pete was weaker, and he was strong when I was weak. "The fact that we had to come home on Monday with our tails between our legs after failing the attempt the first time actually sent out an important message to the youngsters that you cannot give up on things," he said.